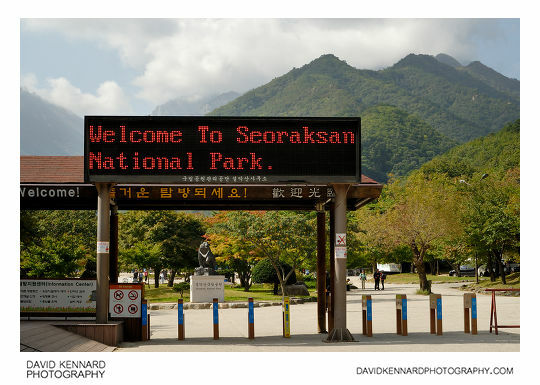 When you get into Seoraksan National Park, they have this large dot matrix screen that welcomes visitors to the park in English, Korean, Chinese, and Japanese (these are the main countries tourists to Korea come from). 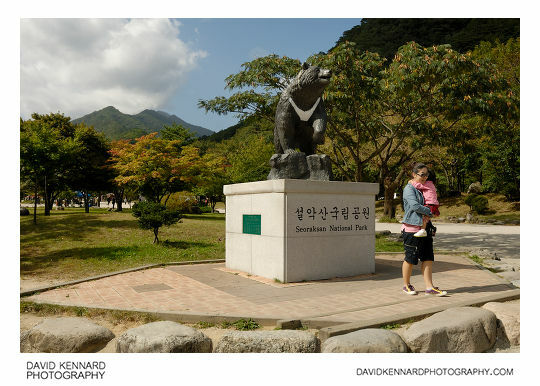 Here is the Korean Moon Bear statue near the entrance to the park. The lady in this photo was having her photo taken in front of the statue by someone else. 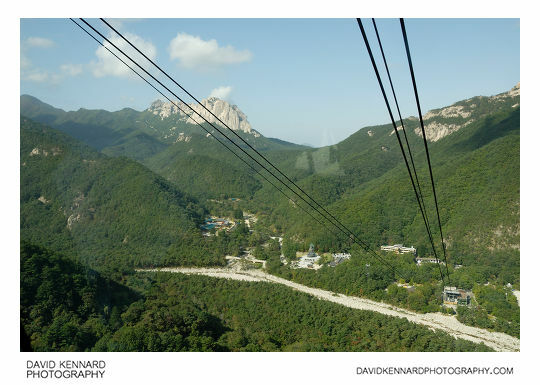 I had been hoping that it would be autumn when we visited, but hadn't bothered to read up on what time the seasons were in Korea, so we were actually about a month too early, as you can see by all the green trees. 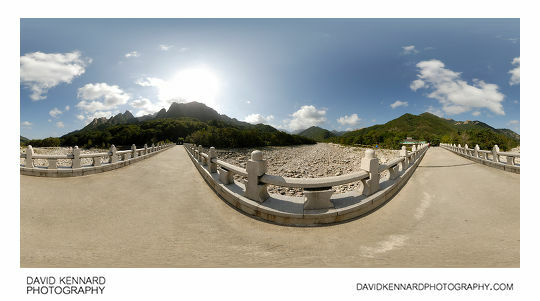 Looking round the main visitor area of the park, we started crosssing this bridge over the dry boulder filled riverbed. 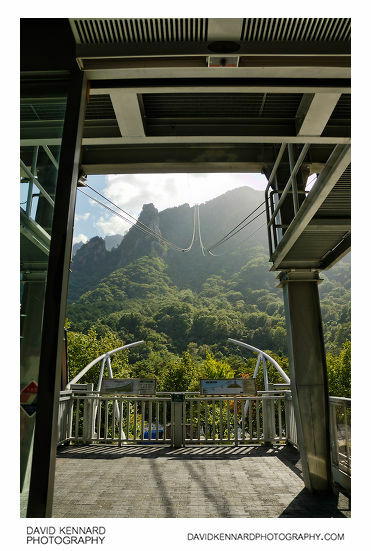 I took a pano on the bridge (above) before we went back to the main part of the park to get a cable car up to the top. Above is the view looking out from the cable car station while waiting for the cable car. Looking out from the cable car you get nice views as you go up the mountain. Reflections from the cable car window and the fact that you're moving can cause problems when taking photos though. Also the cable cars are normally packed quite full, so you'll need to try and get a place near a window if you want to take photos. 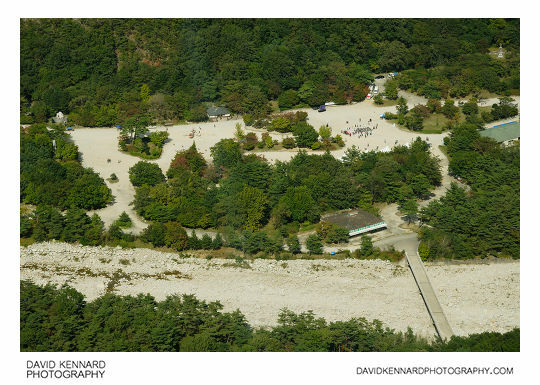 Looking back down, you can see the cable car station below, Sinheung temple to the left, and the bronze unification buddha stands out in the middle of the photo above, though it looks quite small from up here! In the above photo you can see the bridge where I took the panorama earlier, and people putting out chairs for some kind of event in an open area. 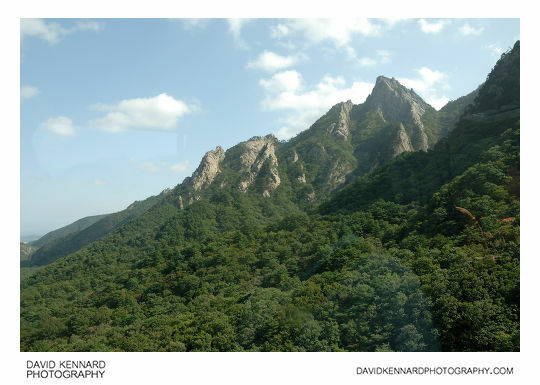 And this photo is looking east towards Sokcho. 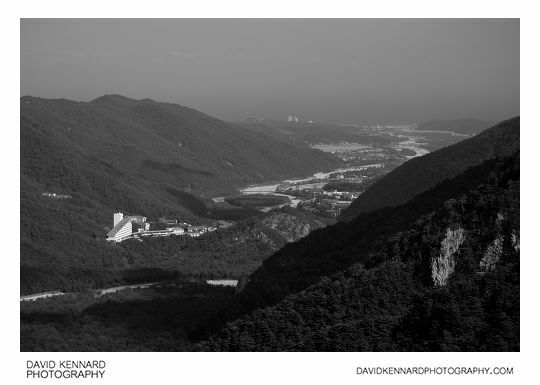 You can see the dry riverbed going towards Sokcho, and also some large buildings in Sokcho in the distance. 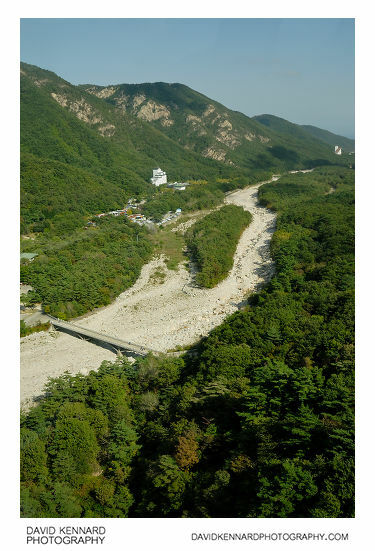 Nearer, you can see the Sorak Park Hotel (Hangeul: 설악파크 호텔), which is one the most convenient hotels to stay in if you wanted to visit Seoraksan National Park for more than one day, but is also quite expensive.